A painting of George Washington which was recently sent for conservation has yielded surprises for its owners, the Sulgrave Manor Trust. The organisation oversees the Tudor home of George Washington’s ancestors in the Northamptonshire village. On close examination, conservator Valentine Walsh noted that what was thought to be a solid dark background of this 18th-century oil painting actually had a curtain in the top corners. This led her to X-ray the painting to see what other details might lie below the murky overpaint covering most of the background. Removing the overlapping revealed that portraitist Gilbert Stuart had originally painted a large column, swag curtains and sky with pink clouds behind Washington. Stuart made many portraits of Washington, one of which is the iconic image that appears on the American one-dollar bill. These paintings all show Washington’s head and shoulders against a plain dark background. Although Stuart was born in the USA, he moved to England in 1775. The portrait was donated to the Manor in 1920 by American banking heiress Faith Moore. 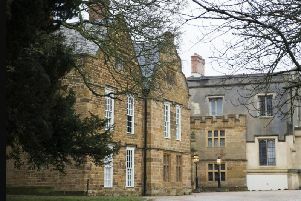 Call 760205 or visit www.sulgravemanor.org.uk for more information about the manor.